Many conclusions can be drawn from Tim’s Vermeer, a provocative documentary about one man’s attempt to recreate (exactly) a painting by the 17th century master, Johannes Vermeer. Vermeer’s purported use of optics inspired graphics expert Tim Jenison, founder of Texas-based NewTek, Inc., to carry the theory a bit further. 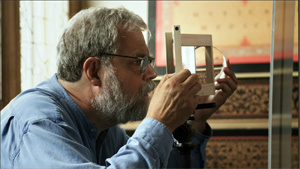 Jenison not only used camera obscura techniques to crack the Vermeer mystery. He added a small mirror that allowed him to copy a real image with amazing exactitude — both in terms of color, intensity and composition. Jenison spent a total of 1,825 days preparing and ultimately producing his version of Vermeer’s The Music Lesson. As directed by Teller — the silent partner in the magic team of Penn and Teller — Tim’s Vermeer becomes a straightforward look at the way one man follows an obsession. It’s possible that Teller’s documentary (which includes an appearance by Penn Jillette) reveals more about the dogged commitment of a man who pursues an unusual interest than anything else. Despite a variety of frustrations and bouts of fatigue, Jenison remains determined. The methodical explanation of Jenison’s single-minded pursuit isn’t without a measure of tedium, but this unusual documentary stands as a fascinating look at the ways in which a non-expert attempts to explain how Vermeer painted with such astonishing precision. Needless to say, many art historians don’t agree with Jenison’s conclusions, and no one in the film makes a case for why Vermeer’s work has so much historical importance. Besides, how much does it matter how Vermeer painted? What if he did use optics to achieve his effects? No one told him where to direct his eye. No one told him to capture seemingly random moments in daily life. In that sense, Tim’s Vermeer is an intriguing look at something of only marginal relevance. That’s why I hope that Teller’s documentary will be taken more as a footnote than a definitive statement about an artist whose work peered so directly, intimately and incisively into the lives of his subjects.